"Jeanne Larsen's translations of 68 poems by Xue Tao will delight readers by their clarity and beauty, and draw admining sighs from any of us who have struggled to make a Chinese verse work as poetry in English....What Larsen does so superbly is to bring out [the original lines'] asymmetrical rhythm, such that we understand subvocally the cadence of the originals.... Brocade River Poems engage us as fine poetry should, while staying remarkably faithful to the texts." "I'm taken with the loveliness of these poems; they excite my ear due, I am sure, to Larsen's own poetic gifts....Larsen's generous notes to the poems made me aware of the subtlety of the original poetic tradition. That Xue Tao's work is rooted in objects allows the essential core of poetry to be retained through the centuries, through translation." 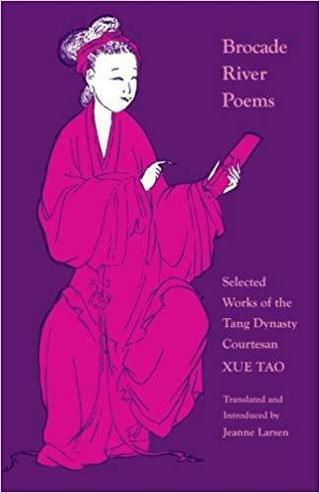 "Larsen's book introduces Western readers to the elegant art of Hsüeh T'ao [Xue Tao], and places her in the poetic context of her age....The effect is more like a series of Japanese haiku than the rigidly metrical, stiffly parallel, rhymed couplets of the Chinese orignals....there are frequent flashes of poetic elegance and techincal expertise, when Hsüeh T'ao's artistry blends with the translator's real talent....It is refreshing, too, to come across genuine wit in Chinese poetry and its translation." Buy HERE from Princeton University Press, or on Amazon, or through your local indie bookstore.